2 Players face each other approx 15 yards appart. 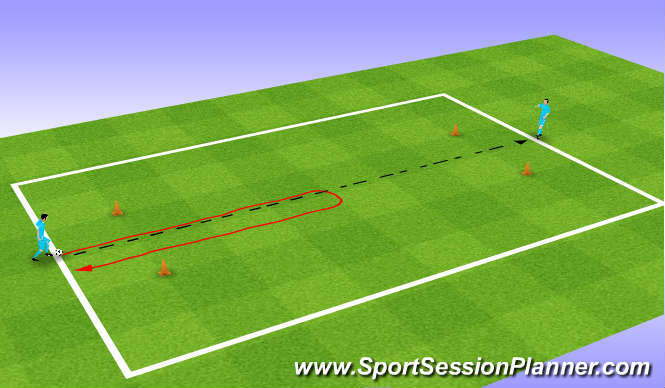 Player one dribbles to middle, performs a turn with right foot, dribbles back to start, same turn with left foot - then passes across between cones to player two who does same. Use all different turs prog partner can close down to make more realistic. Reds play from side to side to side. Blues play from top to bottom. One ball per team get ballfrom one side to the other sap places with end man. Same excersise as screen 2 but is a skill practice only. 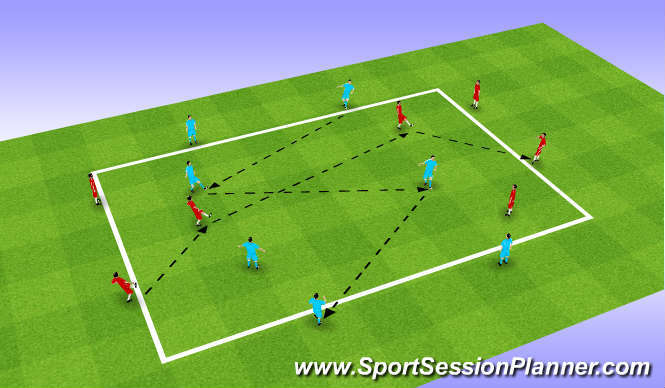 One ball your team is either attacking or defending, trying to play across or prevent other team playing. Check Shoulder, disguise, accellerate away. Good body position to receive - try to play forward/penetrate. find space between players.